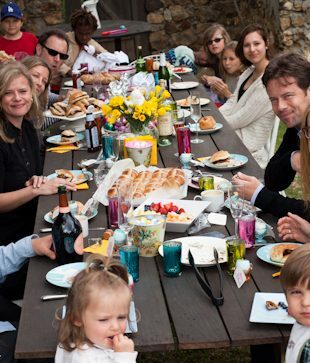 Or introducing the French and the Americans to all things British on Easter Sunday. 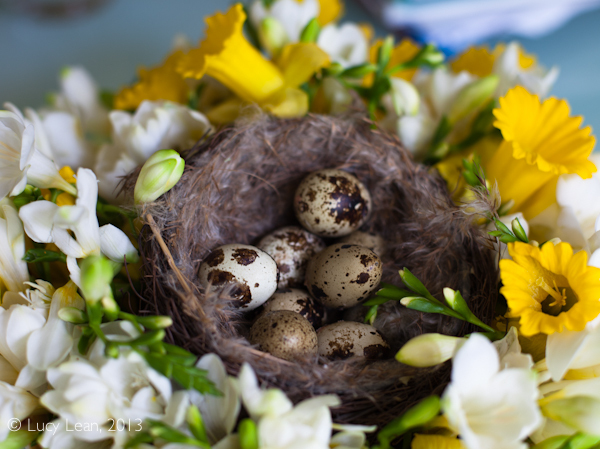 It was also very satisfying to know that we are creating traditions – not just for ourselves but for the other families who came to hunt eggs and feast with us. 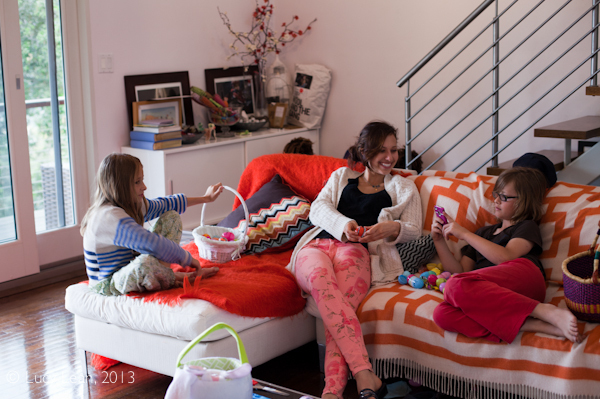 Here are Ara, Taylor and Hop hanging out post hunt – eating chocolate and doing who knows what – I have pics from Easter hunts with Ara and Hop when they were 2. From the smallest – Rêve and Luca to Rémy, Sonny and Timmy who did a lot of recon. of where to find the eggs on the ridge to Lisa who discovered the art of egg beading (more on this in another post) to the biggest kid of all – Ludo – we all enjoyed ourselves. 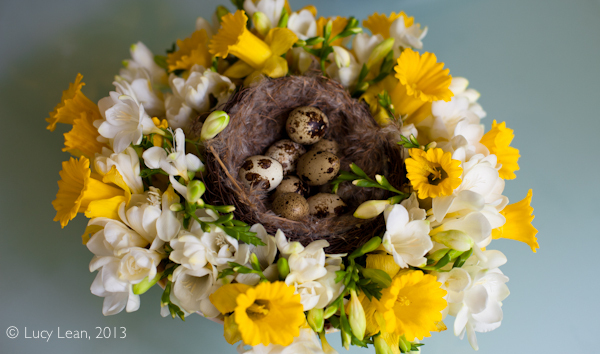 How beautiful is this Easter centerpiece? 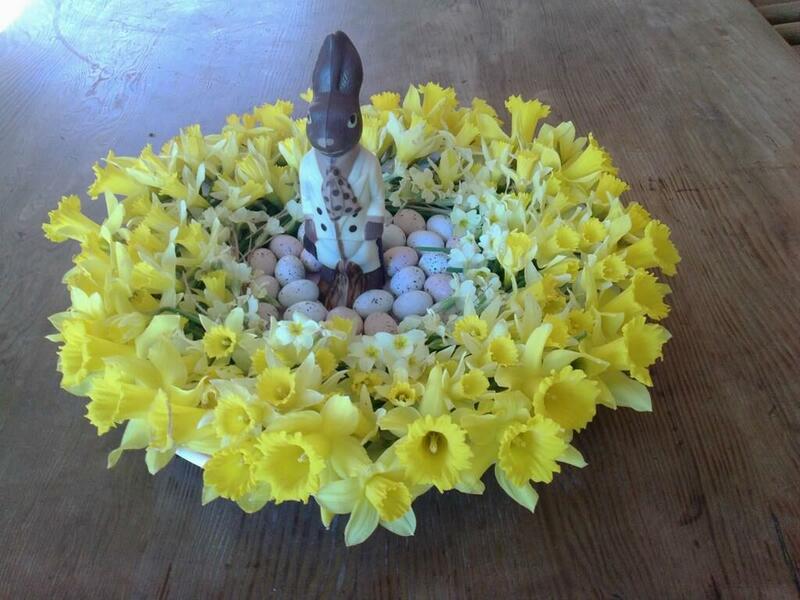 It was inspired by this one below which came in via text from the farm in Devon – trust Brian to have the chicest most exquisite floral display of primroses and daffodils – complete with the Rococo chocolate rabbit proudly sitting in the center with the chocolate quails eggs. My father is the master of making perfectly boiled eggs for everyone on Easter Sunday – not only do I not have access to his chickens I was rather worried about cooking soft boiled eggs for all my guests and switched it up by baking a batch of hot cross buns for everyone to break off from the middle of the table and then slather with butter. 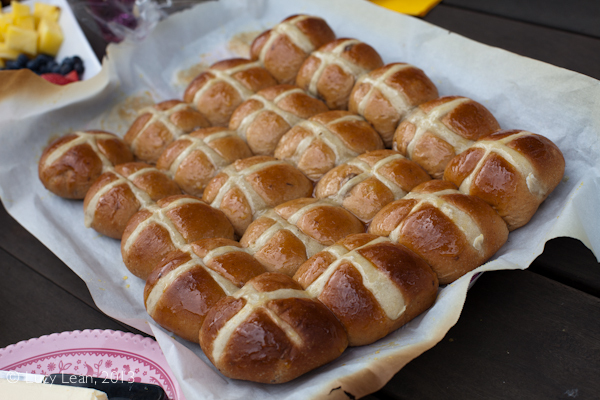 The glaze for the hot cross buns is heated Golden Syrup that is brushed on after the buns come out of the oven – a fine English delicacy for my French friend Ludo to learn about. 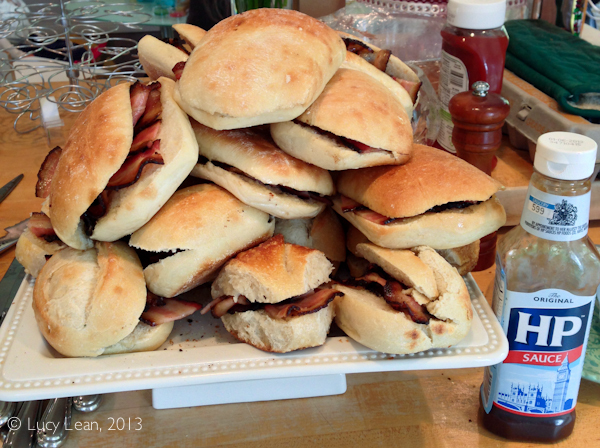 But I needed something else – something classically British and decadent that would be easy to make for 16 people for the brunch: The good old English Bacon Butty. Thank you to Max and Kate (Sonny and Timmy’s parents) for joining the bacon butty production line and even dipping some of the rolls in the bacon fat that had dripped off the bacon and through the rack to the pan below. I preferred the softer rolls – other guests went for the chewier crusty rolls – but everyone was taken with the HP sauce and even more amazed to learn that HP stood for Houses or Parliament – I think they thought I was joking until I showed them the picture of Big Ben, or rather the newly renamed Elizabeth tower – in honor of her majesty’s jubilee last year. 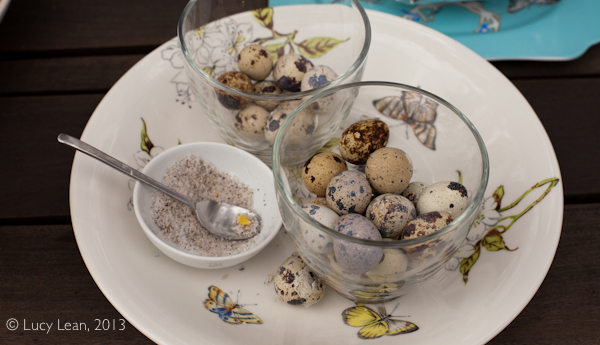 I also boiled some quails eggs for people to peel and dip into salt and pepper. A take on bacon and eggs. Nigella suggested putting the quails eggs in cold water and bringing them to the boil for one minute and then running them under the cold tap before peeling. The colder eggs peeled more easily. Ludo ate one of the praline filled eggs – shell and all – thinking it was a fake chocolate egg with a sweet crispy shell! 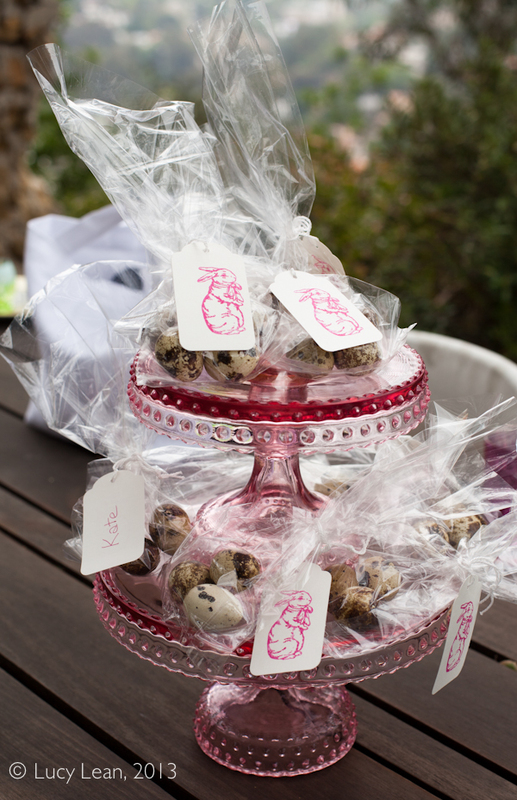 I can’t wait to host Easter again next year in the secret garden – for new friends and old – with a mountain of bacon butties, hot cross buns, quails eggs (both praline filled and the real thing), gorgeous centerpieces and lots and lots of eggs from the Easter Bunny for the kids to find. 2. Place a wire rack inside a large sheet pan and lay the bacon rashers out. Cook in the top of the oven until just turning a little crispy. 3. 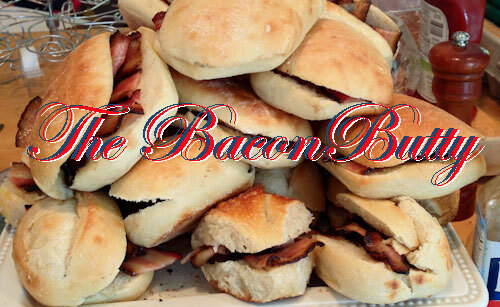 Split open the rolls – butter or use the bacon drippings on the rolls – and then fill with rashers. 4. Add HP sauce and serve immediately. 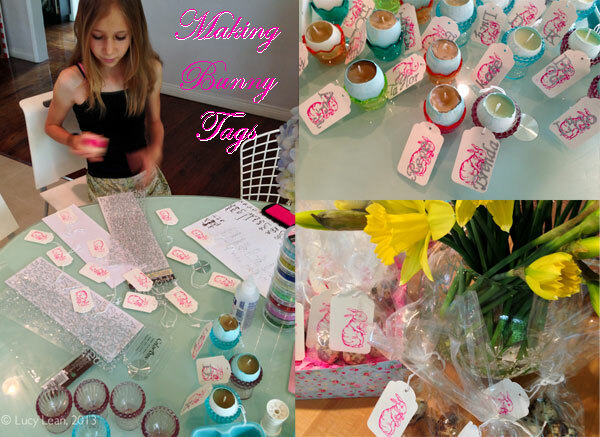 Celebrations are such fun – especially when you have such an amazing “apprentice” in your daughter! 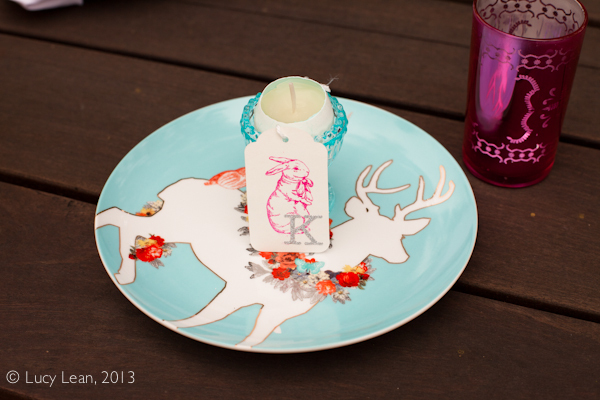 What lovely crafts, and such fun for the kids! 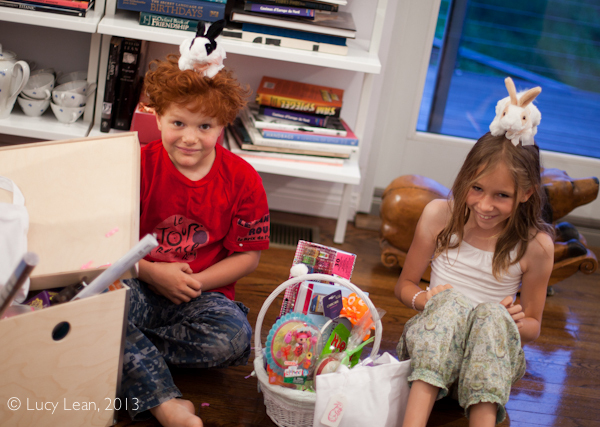 I hope you had a lovely Easter. These sound and look SO good!!! What a fun day! I love it! 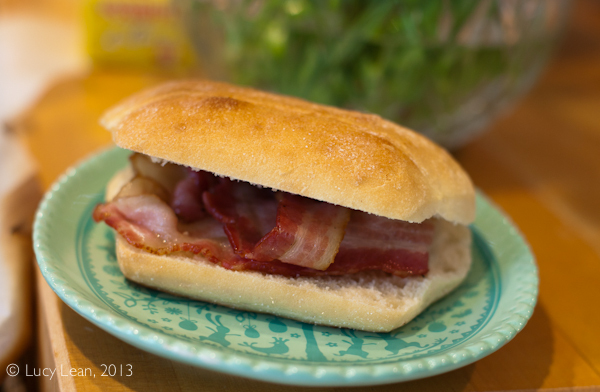 pass the bacon butties! !